FanDuel prices first DraftKings prices second. Per request from people in the forum, I am going to list a few top plays at each position this week. This isn’t a full GPP list. Good luck! This actually wasn’t too difficult. There aren’t a lot of great quarterback plays in the early slate, which is very rare. J.T. Barrett $8,800/$7,800 – Ohio State will play its first game against a ranked team. Michigan State is one controversial call away from being undefeated as well (yes, Nebraska still had a chance to win). Then why the heck is Ohio State -13.5? Several reasons. 1. The game is in Columbus. 2. Ohio State’s defense has been extraordinary and might be their best unit under Urban Meyer. 3. Connor Cook has a bad shoulder. 4. The Ohio State offense is much better with J.T. Barrett taking the snaps with a better dual-threat ability (Illinois defensive line is actually pretty good and Ohio State dominated more than 28-3 final score indicated). 5. Vegas simply has liked Ohio State a lot more than Michigan State in general this year. I’m not calling for an absurd blowout, but I do think the Buckeyes win this game fairly easily with exceed the 33 points they are projected for. Barrett racks up great yardage with his rushing touchdowns. Skyler Howard $6,900 (FanDuel) – When the top teams face Kansas, they usually are too big of favorites to play their star players. West Virginia is in the middle of the pack of the Big 12 with a -28 line and projected for 44 points. Howard should have no problem piling up the dual-threat numbers. 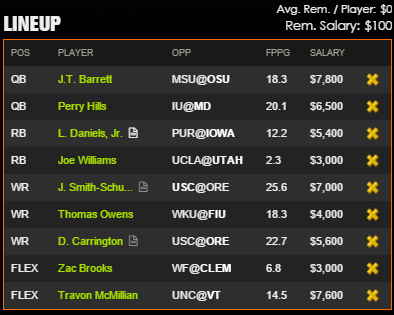 Perry Hills $6,500 (DraftKings) – Hills has become a rushing machine since taking over as the primary starter in Week 6 against Ohio State. Hills has ran the ball 97 times for 423 in those five games! Plus, Maryland has faced five of the best defenses in the Big Ten at Michigan State, Wisconsin, at Iowa, Penn State and at Ohio State. Hills finally gets a weak defense with Indiana at home. Maryland is -2.5 and projected for 33 points, but this is more about the rushing statistics for Hills, his upside for rushing touchdowns and this being my top quarterback play (sorry FanDuel players). Kyle Postma $6,500/$6,300 ! – There’s a decent shot Greg Ward will play in this contest, but in case head coach Tom Herman wants to rest him a week to get him ready for their showdown with Navy on a short week, Postma would get the nod. If that’s the case, Postma is definitely undervalued as he runs the zone read like Ward. Postma certainly doesn’t have Ward’s upside and there’s still no line in this game, but Houston will be favored either way and Postma should do well. This was tough to condense, especially with a lot of good mid-tier backs in this slate. Royce Freeman $8,200/$7,500 – All of a sudden, Oregon and USC are ranked (debatable, but it’s the reality). Oregon is -4.5 at home and projected for 38 points. This game is expected to be a shootout and I agree. With a healthy Vernon Adams, the Ducks are moving the ball much more effectively, which gives Freeman more running room. Travon McMillian $7,800/$7,600 – McMillian has been awesome as the lead back for Virginia Tech. Finally someone has stepped up for Frank Beamer before heads out the door. This will be Beamer’s final home game with the Hokies in his 29 years in Blacksburg as head coach. I’m not too into motivational factors when it comes to picks, but in college sports especially for something like this, it does matter. This is especially true with Virginia Tech being one win away from bowl eligibility. Plus, this will only be North Carolina’s third true road game of the year, they haven’t been very good away from Chapel Hill and this is their toughest test away from home given the environment. North Carolina is tied for 86th in yards per carry allowed (YPRA). 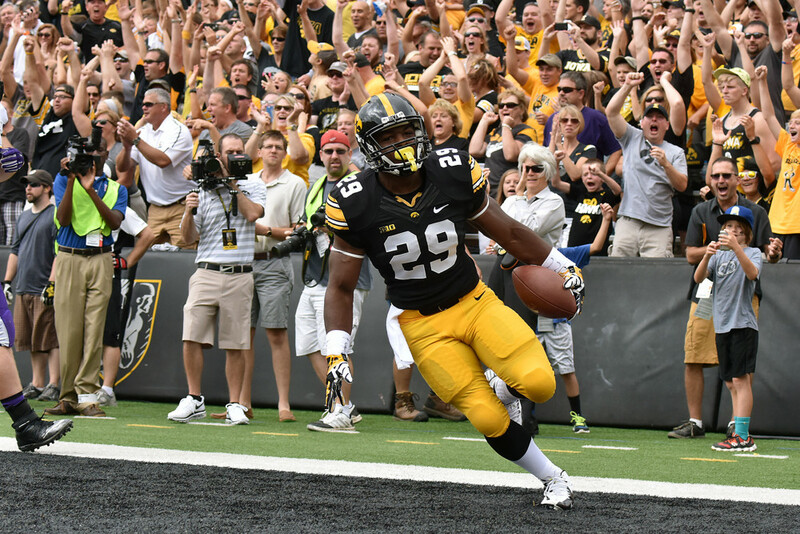 LeShun Daniels $7,300/$5,400 – The Iowa running back situation has been tough to figure out on a week to week basis given all their injuries. It’s been a different situation every week of the year. For the first time since Week 1, they have all of their backs healthy. Daniels is the No. 1 guy with Jordan Canzeri also getting some action in relief (approximately 75/25 when it comes to carries). Daniels is WAY too cheap on DraftKings and is still priced well on FanDuel in this matchup. C.J. Beathard was getting healthier at quarterback, but he got banged up again at the end of the Minnesota game and has a hip pointer issue now. Given that this game is expected to be played in the snow and Beathard’s mobility will be limited again, Iowa is going to ground and pound against a Purdue defense that is tied for 112th in YPRA. Iowa is -22.5 and projected for 39 points. Taquan Mizzell $6,400 (FanDuel) – Mizzell is the clear No. 1 back, but he also leads the team in receptions and nearly leads the team in receiving yards. Virginia is a rare favorite at home with a -2 line and projected for 28 points. Joe Williams $4,500/$3,000 – If you’re worried about who and how much work the new main running back will get, this should help clear things up. According to head coach Kyle Whittingham, Joe Williams could get a heavy workload if Devontae Booker is out (per David Lombardi of ESPN). Guess what? Booker is out for the rest of the regular season. You should absolutely play Williams since he’s minimum salary, but Utah is at home as a slight favorite and going against a UCLA team that is tied for 66th in YPRA. With quarterback being fairly easy to single out the top picks, wide receiver was similar. JuJu Smith $7,500/$7,000 – Smith is healthy and tearing up defenses again. This is an expected shootout, and Oregon is 60th in yards per pass allowed (YPPA). Taywan Taylor $6,200 (DraftKings) – Even with Jared Dangerfield back, Taylor continues to be the No. 1 guy. Western Kentucky is -17 and projected for 42 points at Florida International. I almost put Brandon Doughty on this list at quarterback and wouldn’t mind if you used him there as well. Darren Carrington $6,400/$5,600 – I almost didn’t put Carrington here. He’s more of a GPP than a top pick. However, his price is very reasonable, Oregon has an excellent projection of 38 points and his upside is as good as any wide receiver in the slate. USC is 60th in YPPA. Alex Erickson $6,000/$5,000 – Erickson is the opposite of Carrington – higher floor, lower ceiling. Northwestern has been a good defense this year, but Wisconsin is -10 at home and projected for 25 points. It may not be a lot, but Erickson is the clear No. 1 guy and has put up great numbers while Wisconsin has put up around that many points on the board. Shelton Gibson $5,300 (FanDuel) – Hello Kansas. Artavis Scott $5,300/$6,000 – Way too cheap on FanDuel, but certainly playable on DraftKings given the weak slate. Clemson is 29 and projected for 38 points. Thomas Owens $4,000 (DraftKings) – With Jonnu Smith out for the year, Owens gets a big bump in the Florida International passing game. FIU will be throwing quite a bit to keep up with the Hilltoppers and Owens has had some monster games this year with Smith in the lineup. Troy Fumagalli $2,500 – Simply too cheap. Henry Krieger Coble $2,400 – Coble has been utilized a lot more in the passing game and has been running really bad in the red zone (had multiple targets that were just missed against Minnesota and should have had a PI called on another pass). Both he and George Kittle are used in the passing game, but Coble is the No. 1 tight end. Remember, you don’t have to use everyone from my list to use most or all the salary. By reading my articles and doing some basic research, it’s not too difficult to find some good plays. However, in this case, I put together an example using players only from the list except for Zac Brooks. Wayne Gallman is questionable to play tomorrow against Wake Forest and my guess is that he doesn’t play. Clemson is such an overwhelming favorite and they will need him in more important games against South Carolina and in the ACC Championship. Brooks may not get a huge workload, but he should see an increase and get goal line work. This is also a lineup that works well in GPPs since there are no conflicts of running backs and wide receivers on the same team (granted that’s not as important in college in comparison to the NFL).